While waiting for my hubby from the Pharmacy, I was outside and accidentally I noticed that there are two planes almost crossing each other. It kinda closer but when you were actually above it may be too faraway from each other. So, after witnessing it event, this is what they left behind. Can you see it? If you do want to see more of extraordinary sky scenery, I would recommend to visit Sky Watch Friday for more. I can see it! Looks pretty cool. Hopefully they weren't too close to each other, though. We skywatch wherever we are and whatever we are doing. cant see it, my connection is too slow. grrr..! maybe some other time i will check that again. Just a little. How strange. That's skywatching for you. yes...i can see it. they may have been many miles apart but the trails made it look closer than that. 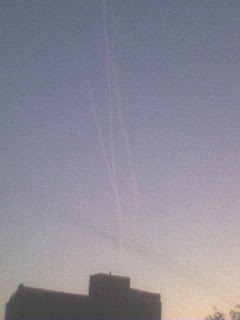 I like the sky trails left by planes. They make me want to fly away myself to some lovely holiday destination. Very cool. Thanks for stopping by.